Human Rights lawyer Anna Morris speaks out against the government’s proposals to privatise the provision of legal representation to the most vulnerable - their most scathing attack on legal aid to date - and against the introduction of “Serco-Law” as multinationals bid to take over the operation of our justice system. If you stand by the Royal Courts of Justice this morning and listen, hard, you might be able to hear the rumble of a convoy of lorries heading for the centre of legal London. These lorries, wearing the cheerful green Eddie Stobart livery, are the government’s new vision for the delivery of publicly funded legal services. Stobart Barristers already provide legal services to private paying individuals and companies and claim to be able to save customers 50% compared to “doing things the old way” by cutting out solicitors. But it doesn’t stop there: Stobart has also been in discussions with the Ministry of Justice about signing massive contracts to provide publicly-funded criminal defence representation from the police station to the Crown Court. And they are not the only ones; G4S, Serco and the Co-operative are also rumoured to be interested in bidding for these contracts. The idea behind this is ‘Price Competitive Tendering (PCT)’. The government wants providers of legal services to tender for contracts to provide legal representation for those accused of criminal offences. In doing so it hopes to reduce the national numbers of criminal legal aid providers from 1,600 to around 400. The contracts will be awarded to those who are able to deliver legal services to the highest number or customers at the lowest cost per unit. As Stobart himself says, “we wouldn’t use 10 trucks to deliver one product.” But what is that ‘product’ in the context of our justice system? The ‘market-based approach’ to the provision of public services is sadly not new, even within the legal sector, but PCT, if implemented, will effectively mean the end of the high street legal aid solicitor, the specialist human rights lawyer and quite possibly the independent criminal bar. You only have to think back 20 years to some of the historic miscarriages of justice that have been overturned, in large part assisted by the commitment and forensic ability of specialist legal aid lawyers such as Gareth Pierce, Imran Khan, Louise Christian and numerous others. Without them we would not know the truth about the Guildford 4, the Birmingham 6, or the Cardiff 3. What is now clear is the government doesn’t want these kind of lawyers operating within our system and put quite simply, wants to drive them out of business. As anyone who works with the criminal justice system will tell you, clients are not customers, but often individuals with complex issues, needs and legal challenges. It is the job of a skilled representative to explore evidence, challenge facts and question the legitimacy of their client’s accusation by the state. This is particularly true of those working with young people, those with mental health problems. There are also those cases where the state engages in the political criminalisation of those who belong to particular communities, ideologies or circumstance through terrorism legislation, public order acts and anti-social behaviour legislation. The majority of criminal cases can not be reduced to a low cost ‘unit’ that can be simply transported from the start of the process to the end. Justice is not simply a question of logistics. The government also proposes to remove the right to choose the solicitor who will represent you in a criminal trial. The provision of a duty solicitor scheme at the police station has been a valuable part of the legal advice landscape for many years but the removal of the right to chose who represents you beyond that first stage will effectively create a two-tier justice system with those who can pay to choose lawyers based on merit rather than contractual obligations. The United States has such a system with an under-resourced public defender service for the majority and high profile and high-cost attorneys for the rich. The British justice system stands alone in its provision of the highest quality lawyers to everyone, irrespective of their means. But not for much longer. The provision of quality legal services based on the ability to pay is not new. Legal aid has been means tested in the magistrates’ court since 2006 and most people earning a full-time wage, no matter how modest, are denied public funding. Those denied funding are simply forced to represent themselves. But there are already warning bells sounding about forcing individuals to appear in person. In April of this year a Judge in Durham Crown Court refused to sentence a man who admitted stealing more than £5,000 from an elderly woman. The man had pleaded guilty before magistrates but later told the writer of his pre-sentence report that he was lawfully entitled to the money. The man said he had spoken to the duty solicitor but was representing himself at crown court because he had been declined legal aid. “I can’t afford a barrister,” he said. Whilst the government may think the proposals will save money, the Judiciary have warned that the increase in litigants in person appearing before the courts unrepresented will prove more, not less costly to the justice system. In a recent Judgment of the Court of Appeal, Sir Alan Ward stated ”It may be saving the Legal Services Commission which no longer offers legal aid for this kind of litigation but saving expenditure in one public department in this instance simply increases it in the courts.” The family and immigration courts already know too well the increased burden that litigants in person put on the system and the cost is not just economic, but emotional. 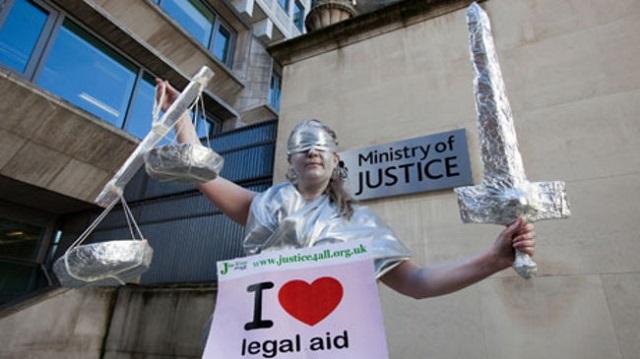 But PCT is just one part of the most radical shake-up of Legal Aid since its inception in 1949 as part of the post-war commitment to the welfare state. The first wave of reforms already implemented by the Legal Aid, Sentencing and Punishment of Offenders Act in April 2013 included the exclusion of swathes of areas of advice beyond the scope of funding such as welfare benefits, immigration, employment, divorce and child residence, and school exclusion appeals. There is now a proposed further reduction of fees in areas of work such as family and civil legal aid of around 30%, The net effect of these waves of cuts is that post-2015 there are unlikely to be any specialist civil legal aid lawyers left at all. It is civil legal aid that has supported bereaved families through inquests into the deaths of Jean Charles de Menezes, Ian Tomlinson and Mark Duggan, and which will hopefully support many families demanding answers from the 2014 Hillsborough inquests. It is civil legal aid that gives these families a route to accountability by funding claims under the Human Rights Act against the police, prisons and the armed forces for breaches of their obligations to protect the lives of their loved ones. The proposals also put under threat the funding for making an application for Judicial Review, one of the key ways an individual can challenge decisions made by public authorities. The impact of the cuts on vulnerable individuals cannot be underestimated. The denial of access to legal advice comes as a sucker punch following the body blow of the slashing and restructuring welfare benefits. The Institute of Race Relations has stated that they will severely impact on BME clients and therefore increase social exclusion. The housing charity Shelter has been forced to shut over a third of its advice centres across the country, and both the British Red Cross and the Citizens’ Advice Bureaus have said that the cuts have left them having to reduce services and make redundancies. In an even crueller twist, the government proposes to limit access to civil legal aid to those who have been resident in the UK for more than 12 months. The measure will affect the ability of recent migrants or those with vulnerable status such as trafficking victims, to challenge their treatment in the criminal or civil courts, compounding the two-tier system that will inevitably be created. But it appears that this (and previous) government’s commitment to the privatisation of public services knows no bounds. With the majority of court custody and enforcement services contracted out to the likes of Serco, 14 private prisons run by G4S, and proposals to contract the provision of probation service to a similar company, the question is whether public interest will have any place in a court of law? Instead, the courtroom will be full of corporate representatives, each seeking to reduce overheads such as justice and compassion in the name of increasing profit margins. And what about a conflict of interests? We could soon see the same company that represents you at court, detaining you, transporting you to court, then monitoring you on electronic tag or putting you in one of their corporate run prisons. What economic incentive does that company have in providing legal representation that strives to test the prosecution case and acquit the innocent? The guilty are worth more in revenue. The legal and justice sector is rightly up in arms: Early Day Motions and Petitions are swirling through 38 Degrees and Avaaz. The Northern Circuit of the Bar recently held an 800 strong emergency meeting during court hours to show the strength of their opposition and there are demonstrations and mass meetings being arranged all over the country under Justice for Sale, Save UK Justice and Save Legal Aid. What is important to recognise is that this fight is not just about remuneration for lawyers, but for the very core values of our justice system. Lawyers must unite with court workers, probation officers, youth justice workers, law-centres, trade-unions, NGOs and every other group committed to the rule of law. If we don’t act now and stop this juggernaut from smashing into our legal system we will never be able to recover access to justice from the wreckage of the welfare state. We must all demand an answer to the question: at what price justice? Anna Morris is a barrister specializing in human rights and criminal justice at Garden Court Chambers in London. She is also the Vice Chair of the Haldane Society of Socialist Lawyers and the co-author of The Protest Handbook (Bloomsbury Professional). « Previous: Special Report | Why was a Sunday Times report on US government ties to al-Qaeda chief spiked? My elderly mother and her property was being abused by her live-in boyfriend. She had a stroke (in no small part, because of him) and was paralyzed. This bum got the entire legal aid society backing him. He refused to vacate her property in order to sell it (which he destroyed). He even had a private lawyer, the judge in the town, to pull strings. A legal aid attorney went to the nursing home to get my mother to sign some documents, which she refused. During deposition, he admitted as much. The legal aid lawyer’s boss lied and covered it up. You have a bad reputation and deservedly so.